Growing up in the countryside may protect your mental health as an adult, research suggests. A study of nearly a million Danes found youngsters who live in green spaces are up to 55 per cent less likely to develop a mental-health disorder in later life. Green spaces help create sociable communities, as well as encouraging people to exercise, the researchers believe. This then improves a child’s cognitive development, which may positively impact their mental health. The research was carried out by Aarhus University in Denmark and led by Dr Kristine Engemann, from the department of bioscience. More than 450million people globally suffer from a mental-health disorder, according to the World Health Organization. In the UK, 19.7 per cent of people over 16 showed symptoms of depression or anxiety in 2014, Mental Health Foundation statistics show. And depression affects more than 16.1million Americans (6.7 per cent) every year, according to the Anxiety and Depression Association of America. The researchers used satellite data collected between 1985 and 2013 to assess the green space around the childhood homes of almost one million Danes. This data was then compared against the risk of developing one of 16 different mental disorders later in life, including schizophrenia, anorexia and depression. Results – published in the journal Proceedings of the National Academy of Sciences -revealed people who grew up surrounded by lots of green space were less at risk of a mental-health disorder. This remained true even after adjusting for socioeconomic status, urbanisation and a family history of mental-health problems. Just 15 minutes of jogging every day could reduce the risk of depression, a doctor said earlier this month. Speaking on the back of a recent study that found physically active people are less at risk of the mental health condition, a medic from Massachusetts General Hospital urges the public to ‘just move’. Whenever patients come to him complaining they are feeling down, the doctor tells them to ‘get outside and do something’ before he will prescribe an antidepressant. ‘We have had the opportunity to use a massive amount of data from Danish registers of, among other things, residential location and disease diagnoses, and compare it with satellite images revealing the extent of green space surrounding each individual when growing up,’ Dr Engemann said. ‘With our dataset, we show that the risk of developing a mental disorder decreases incrementally the longer you have been surrounded by green space from birth and up to the age of 10. 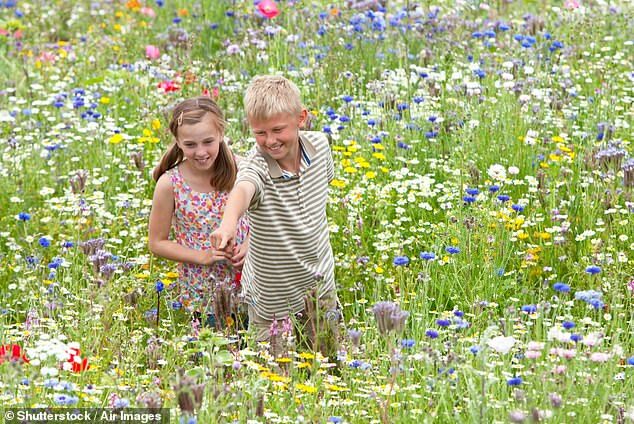 ‘Green space throughout childhood is therefore extremely important. ‘There is increasing evidence that the natural environment plays a larger role for mental health than previously thought. Noise, air pollution, infections and poor socioeconomic conditions increase the risk of a mental disorder, according to the study. The researchers are calling on city planners to design greener cities to improve the public’s mental health.